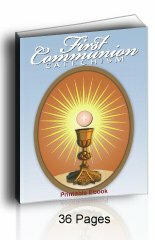 You will want Pro Multis Media's wonderful audio Baltimore Catechism CD before, during, or after your child is finished studying for First Communion. Matthew Arnold has arranged audio questions and answers for the BC No. 1. The #1 is a subset of the BC No. 2. All of the First Communion Q&As (BC#0) come from the No. 1. If you do not yet have a booklet, you wouldn't need three booklets. The No. 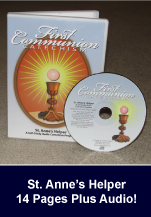 1 matches this audio CD exactly; and the #2 has the rest of the answers that are good for younger students to know, but not necessary to receive the Blessed Sacrament. The presentation is lovely with the mother asking the questions while one of her children gives the answers. Listen to a sample below. 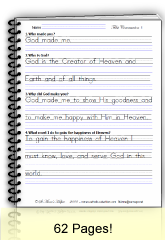 Then they can review the audio CD to memorize the answers and prayers. Some children can simply hear the answers and learn it on their own. Reading is not really necessary. Learning the truth is necessary. Preparation for Baptism, Penance, and Holy Eucharist. Lessons arranged on 33 tracks for easy navigation. Great to use before, during, and after First Communion. Useful for adults preparing for the sacraments. Also, this makes a great gift of faith for those adult catechumens preparing to be Baptized. They can listen to it in their spare time as an easy review. Buy the Baltimore Catechism CD at Amazon here. You can also search online at Gutenberg or Archive to find text of the questions and answers. You can download and print the complete text from these sites. The Baltimore Catechism No. 1 is a subset of the No. 2; so if you already have the No. 2 you won't have to buy another book. Simply mark the No. 1 questions. 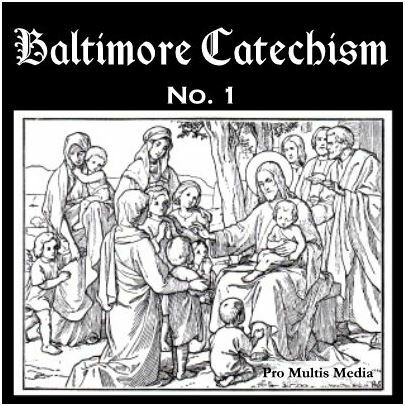 Buy Pro Multis Media's audio CD of the Baltimore Catechism at Amazon. 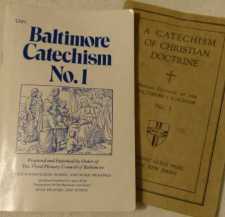 Many parish schools still use the 1885 Baltimore Catechism and most Catholic homeschools recommend it. If you're looking for discussion starters the Baltimore Catechism is an excellent booklet. It gives you many apologetics moments. Children often wonder why the answers are written the way they are, or they give you an occasion to discuss important elements of the Faith that you might not have otherwise remembered. Our Lady of the Rosary School. 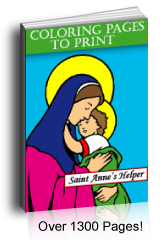 If you need someone to help your children learn the prayers and the answers, this audio Baltimore Catechism CD is an awesome tutor. A recording can be played over and over to help your children memorize the answers and prayers. You can also use it to review the questions before a quiz or test while driving or doing other things. Load it on your MP3 players to keep it handy. The Baltimore Catechism is the short cut to know, love, and serve God in this world, and to be happy with Him for ever in Heaven. You'll love that this was produced by a Catholic family with a mother/daughter team asking and answering the questions with beautiful diction. They are so easy to understand, saying the words clearly and distinctly. At a time when it is hard to find good Catholic materials that are not filled with fluff, this CD is a welcome addition to our library. May God grant them saintly children. You'll be glad to know that they have put their business under the protection of the Blessed Virgin Mary. Buy Pro Multis audio Baltimore Catechism CD at Amazon here.